If the Archbishop of Canterbury said there was no God you could hardly be more surprised than when the Pope of proletarian literature - Alan Sillitoe - said there was no such thing as a proletarian writer – specifically “an oxymoron that only a moron would use”. Well – up to a point Lord Sillitoe. One might argue there are only good writers and bad and the reader shouldn’t bother about where they’re coming from, but the proletarian writer is a literary entity, (just ask Ken Worpole) and an unjustly neglected one who doesn’t get a fair shake when it comes to publication. Alan, of course, can’t be considered a prole these days – he said goodbye to all that long ago – but has he written anything better than Saturday Night and Ragman’s Daughter since? You might've thought that such unreconstructed individualists as writ­ers would have found the transition to collective word-farming difficult to take - that some would rebel, or engage in seditious samizdat publication. Not a bit of it! 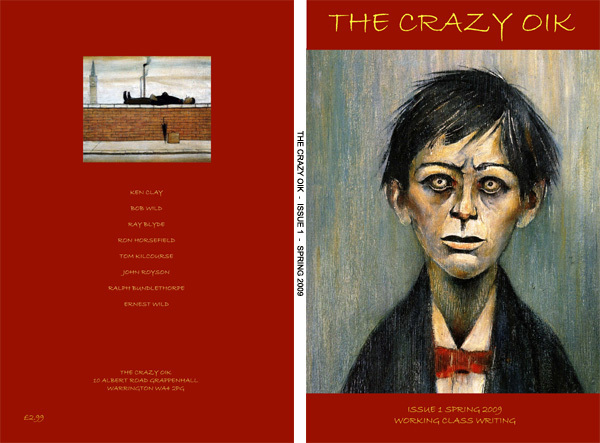 Suffice to say, all those burgeoning creative writing courses in the run-up to the Great Recession had produced a startling uniformity of both style and approach among younger writers: these were creative labour­ers deeply conditioned to accept the kind of intrusive and critical editing that forms the corporate culture at the Ministry of Fiction. Crafty oiks, like Lord Sillitoe, learn to jump through the Ministry’s hoops but there’s also the crazy oik who just feels the urge to write. He doesn’t sign up for Professor Amis’s writing course at Manchester University (and he probably wouldn’t get in if he tried) but he just has to get that stuff on the page even if it finishes up in a shoebox in the wardrobe. We don’t say Ray Blyde is a better poet than TS Eliot or that Tom Kilcourse is the new Chekhov. We simply say these writers are interesting and funny and that if it had been left to the industry you’d never have come across them. Prole lit is a vast oilfield under a desert where all the drilling rigs are owned by the middle class: result – a desultory trickle. The Manchester based magazine Voices tapped this reservoir for a while but that was dismantled twenty five years ago. The Crazy Oik is, therefore, a modest new borehole into that neglected reservoir. We look for eccentricity, authenticity, a spark of wit, or as Jack Conroy, editor of the Anvil put it “we prefer crude vigour to polished banality”. Feel like contributing? Know any crazy oiks? Get in touch. With metal as with wood. He couldn’t stand the height. "Why don't you come back later. "I fancy that, I'll call again". Said my daughter’s boy friend’s dad. One night when all was quiet. And set the blighters free. He's such a tender hearted man. Retirement! It’s a bugger int it! Nobody told me it’d be like this. I still get up early – force of habit I spose. Have a cuppa – praps a bowel movement – examine me stool. Read t’paper if that lazy arse girl has managed to deliver it before half seven. I read everythin coz there’s nowt else to do – even t’adverts. Then I look out of t’winder to see if next door’s cat wants to come in. I buy her nibblers. If it’s not rainin or too cold I gets me coat on and goes t’park. I like to teach the youngsters the wisdom of the tribe (It must be coz I can’t lecture me old workmates anymore). If little Wayne is havin trouble in t’toilets I show him how to hold his todger. I wave it about a bit. “Now then Wayne” I say “Try it wi mine. There’s a bit more to get hold of. That’s right wag it up and down. See how high you can get up t’stone. Now tug on it as though you was pulling a garden hose off its reel. That’s right Wayne.” They soon get the hang of it. Then I go over t’ swings to see if any little girls want a push. Or if they’re trying to toss up against the wall I help em to push their skirts into their knickers. Uncle Ralph they call me. On t’way back I once bought another paper (Still the Guardian coz that’s in line with me political position) but bugger me if it wasn’t exactly t’same as the one I had delivered! How can they sell so many if they’re all t’same? Gets in has another brew. Same four walls! No bugger to talk to. I ring the office but they’ve all got answer machines now. When I leave a message nobody rings back. “Owt you want doing lads?” I say. “Any likkul jobs? Owt you want deliverin in a likkul white van?” That’s what I’d really like to do but when I enquired I was told that every retired old fart in the country is just queuing up for a job drivin a likkul white van. Some of em even pay to drive the van. Sometimes someone’ll ring me. Usually a girl sellin double glazin. Although I’ve had the whole house done I crack on I’ve not. Before you know it we’re rabbitin on like nobody’s business. Yis it’d be great to have it in – doors an all – an what was the air gap again? 20mm? Ooo that is a lot! An are you married Samantha? No? Courtin? Yis I thought so with a nice voice like yours. I bet you an him get up to some things don’t you. An what colour are your knickers exactly Samantha?” I used to get lots of calls like that but they’re droppin off a bit now. I hear there’s a government agency you can register with to say you’d welcome such calls and were always ready to listen an chat – but nobody seems to know what it is. Turns t’wireless on to hear the news. Sometimes somethin’s happened since the paper was printed. The highlights are when Gordon Brown comes out with a new economic statement to say we’re well on course and things are getting much better. Or Jack Straw says he’s against crime. It fair bucks you up that does! 12 o clock, on the dot, has another brew and me sandwiches. If it’s Monday, Wednesday or Friday it’ll be meat paste, and if its Tuesday or Thursday or Saturday it’ll be fish paste. It may seem a bit unadventurous but then again it’s this regime that makes me stools so consistent. I might try crab if there’s a holiday comin up. Holiday! What am I talkin about? No more holidays for me! Its one big holiday! But you’ve got keep regular if you want a rich and fulfilled life. Me tea is the highlight. Gets in, hangs me coat up, puts me slippers on and starts to prepare the meal of the day. I love dawdlin over t’details. First I open the M&S box where it says “Open Here” an I takes out t’Chicken Kiev in its silver foil tray. If it’s a Monday there’ll be two Kievs so I have to use a tray I’ve kept from the night before – washed of course - and return the second Kiev to the fridge in the original box. I read the instructions in English, French, Spanish an German to see if owt’s changed since I last bought one. Then I pop it in’t oven for 25 minutes at 190 degrees C. I check the sprouts I left boilin before I went out for a walk. I can’t stand them crunchy veg. Then I open me vac-u-vined half bottle of Mouton Cadet. Well I’m retired aren’t I? You can’t tek it with you! The half bottle usually lasts me three nights an it tastes just as good on the last night as it does on the first! While it’s all doin and the wine is chambrein I listen t’ six o clock news. Gordon says were still on course and Jack’s still against crime so everythin’s OK. I still keep up standards for meals. No trays on me knees in front of t’telly for me. I put a tie on and eat at the table with a cloth and a knife an fork. Eee sometimes I feel like Lord Shite dinin at Chatsworth! Afterwards I wash everythin immediately an vac-u-vin the half bottle and put it back in the units (me cellar I like to call it). Then I’m right pogged. Usually I doze of in’t chair. Wakes up for t’nine o clock news on t’telly. Yis – there’s a picture of Gordon saying we’re still on track an Jack, with them bottle ended bins of his, saying crime must be stamped out. The blanket comes on on a timer if its between October 25th and March 28th. Gets in bed about half nine but usually gets up for a piss about 1.35am and 3.50am. Sometimes I turn t’garden light on and might see a hedghog.